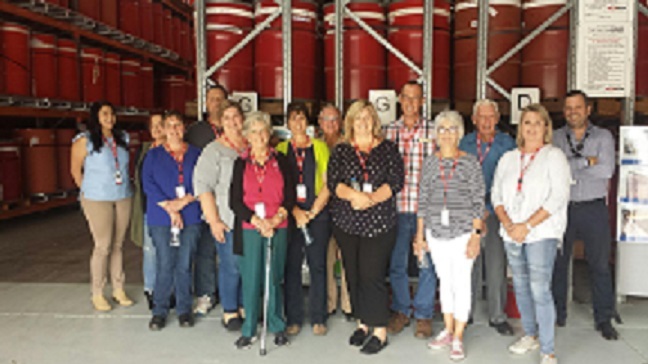 Kimba locals welcomed to Australia’s nuclear facility Eleven members of the Kimba community were on site at Lucas Heights yesterday, to see first-hand Australia’s nuclear technology and radioactive waste management expertise. The delegation to the Australian Nuclear Science and Technology Organisation (ANSTO) included people with a variety of views on Kimba hosting the National Radioactive Waste Management Facility. It included four neighbours of the two volunteered sites in Kimba, and three members of the Kimba Consultative Committee (KCC), as well as other interested community members. Patricia Beinke saw the OPAL multi-purpose reactor, where ANSTO stores low and intermediate level radioactive waste, and how waste is prepared for transportation. “It was a much bigger campus and complex than I had ever envisaged. I read all the information that comes my way, but wasn’t expecting this scale,” Mrs Beinke, who is a member of the KCC, said. “I just found the trip so good. The scientists and engineers spoke on a level that everyone could understand. Austen Eatts has property that neighbours one of the volunteered sites, and is opposed to the facility, but was pleased to have seen ANSTO’s campus. “I have always had a reasonable idea of what happens at ANSTO regarding medicine and industry, and what they are doing there is very good actually,” Mr Eatts said. Mr Eatts stressed that he is against the idea of a facility anywhere in Australia that could store high level, imported waste from overseas – a proposition not being put forward by the Federal Government. Bruce McCleary is the General Manager of the National Radioactive Waste Management Taskforce, and said it was great to host people with a variety of views on trips such as this. “Tours of ANSTO’s medicine manufacturing and radioactive waste facilities are a great information tool for communities considering if they want to host a radioactive waste industry,” Mr McCleary said. “They are also a way of us establishing what questions the community still has, and for them to see and hear from experts who work with this material every day, first-hand.